How to plan for movement of a top when it's wrapped in a mitered frame? Ok, this one’s got me stumped. My Mother In Law requested a coffee table like the one below and I just so happened to have to perfect reclaimed lumber for this project. I’ve made a few panel glue-ups that include bread board ends with floating tenons, but I have no idea how it should work once the parallel running mitered edges are thrown into the picture. The panel would want to move inside that frame, width-wise. Does that mean I’m going to have a gap between the left/right edges of the top and the left/right frame that changes seasonally? Assume I’d tenon the sides while the top itself is all a glue-up. Hopefully my question is clear. Thank you. Unless that design is concrete, not open to change, I would drop the two long frame sides and go with breadboard ends. I built this table in 1976 and the miters are still fine but I don’t have a solid wood center and glass do not expand like wood. If that is not desirable then make the frame float, not glued, around the center section. In any case, be sure to finish the under side of the table and frame the same otherwise that would leave them open to the “elements”! So it looks questionable to you, too, huh? I really like the look of that full frame, but you’re right, I could just switch to standard breadboard ends. The big advantage to the above design is that I could easily bury all the milled edges. The best way to get that look is to use a stable sub-straight and veneer the center of the table. (the part inside the mitered frame). I’m with oldnovice. You could do a tongue-n-groove floating frame around the top, but you’d have to leave a gap on the sides that would be unsightly and a dust collector. AlaskaGuy has a good idea! If you can cut 1/8” veneer sheets from the lumber you want to use, veneer that to some plywood, then you won’t have any issues with expansion. Be sure to veneer both sides of the plywood otherwise you will really have problem! I have seen David Marks do this because of the same concern you have and he didn’t want to waste some really beautifull wood on only one table. If you can cut 1/8” veneer sheets from the lumber you want to use, veneer that to some plywood, then you won t have any issues with expansion. Be sure to veneer both sides of the plywood otherwise you will really have problem! 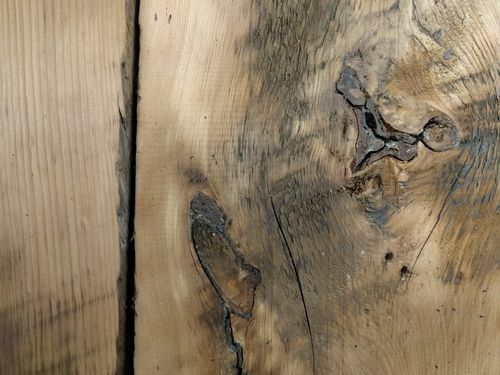 I have seen David Marks do this because of the same concern you have and he didn t want to waste some really beautifull wood on only one table. I’d scrap the panel of doom and just go w/ parallel boards for the top. Breadboard the ends if you must, but I think that is also unnecessary given the rustic look of this table. I d scrap the panel of doom and just go w/ parallel boards for the top. Breadboard the ends if you must, but I think that is also unnecessary given the rustic look of this table. His original design looks appealing. Your plan would totally change the look. It wouldn’t be the same table. It’s doable by changing the construction details so it works. If you shun learning new techniques because it easier not to…. then you’ll never progress past the point where your are now. Ugh. I thought this would be a simple project. I’m not afraid to try to new techniques, but I am afraid to try making 1/8” veneer from INCREDIBLY rough cut lumber. The variances in some of the pits are probably 1/16+. I’ve never tried veneer and my largest assembled band saw doesn’t have the capacity for these boards, unless I rip them, which is an option I suppose. I feel like the thinnest I’d be comfortable with is 1/4” and I don’t understand how resawing lumber improves the seasonal movement. Is the idea that once glued to a stable base the movement is physically not allowed? Something has to give, no? I really like the concept of “honest” furniture, especially for this type of piece and ply feels like cheating to me. I’ll bet the piece shown above is exactly what AlaskaGuy is proposing, since it is a commercial piece. “Honest” furniture, is something you have hand crafted yourself. Not taking advantage of modern materials and techniques, is silly and results in an inferior product. All of those antiques made from solid wood…it’s because they didn’t have access to our current material and tech. It’s not cheating, it’s good practice. You’re also correct about even 1/8” or 1/4” thick still needing to have room for movement. The suggestion for using a plywood substrate was for a veneered top surface. You have to either let the mitred end rails float, with a breadboard type attachment and open mitres or a frame and panel construction with the space in the frame for the panel to float. The first option can be partially concealed by extending the ends of the mitres in a tenon that slides in a mortise in the side rails so it doesn’t leave a through and through gap at the mitre. i.e. a breadboard end with a mitered half lap joint. The frame and panel can minimize the ‘dirt trap” by a mild chamfer on the frame and panel. 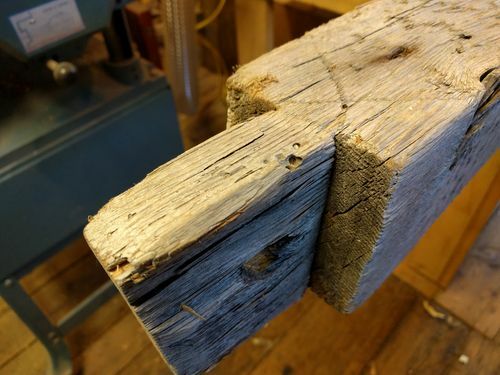 where they tenon together. I’ve got some REALLY nice, REALLY solid furniture that’s probably older than your home. Using age-old techniques (which I’ll admit I’m just a newbie on) is enjoyable. Letting each project speak to me and going with the flow is enjoyable. 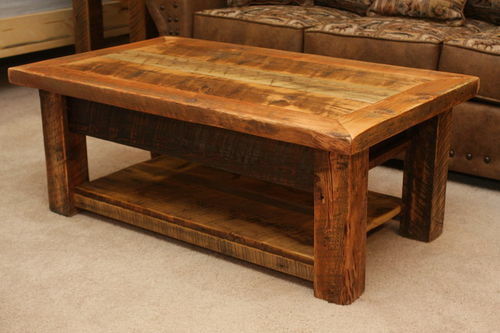 Nothing against the mentioned concepts in general and for many, if not most projects, but there’s also nothing wrong with building a big, solid coffee table out of 1900’s reclaimed lumber (and a MUCH older beam) and no ply. 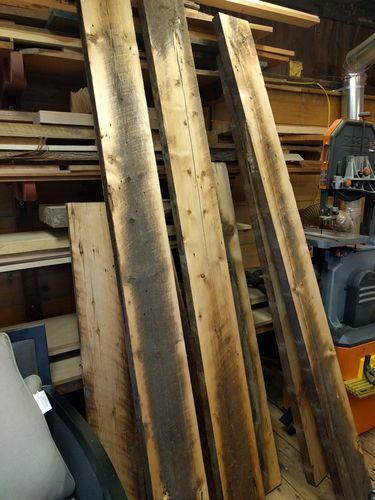 Check this thread out from Finewoodworking – The second post shows a picture of a tabel top just like that one – they created a frame and panel top that will allow for season wood movements similar to a kitchen cabinet door. Probably won’t fully solve the problem – but it’s a starting point for additional ideas. Letting a project “speak to you” or “going with the flow” is fine, but the laws of physics still apply. A solid wood top trapped in a glued metered frame, over time will split the metered joints. I doesn’t matter how “olde timey” the wood is or how your flow is going. 1. Use the metered frame with a solid floating top that is undercut and rabbeted to allow for seasonal expansion. 2. Use a solid top without a frame, with or without breadboard ends. 3. Use a metered frame with a substrate and veneered top. Not all old or antique furniture used solid wood surfaces, and solid wood alone is NOT necessarily an indicator of quality. In fact furniture taken from King Tuts tomb showed high quality joinery and handout veneers. Build it how you will, but you wouldn’t have asked that question if you hadn’t thought or been told that there was something inherently wrong with that design. I think something’s been lost in translation here. I’m not arguing against physics or even Tut’s carpenters. I’m sure they were skilled. I asked because I didn’t think it could be done using solid wood and got my confirmation. I’m chosen the bread board ends – a compromise in the look that I wanted, but the wrapped frame would have been a compromise in how I wanted to build it. toddbeaulieu, now that I see your wood I see the difficulty with the veneeer!